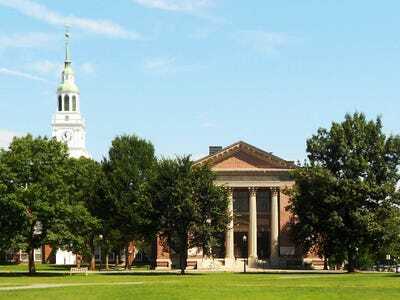 Forty three students at Dartmouth College have been “implicated in an academic dishonesty case” in an ethics course, student newspaper The Dartmouth reports. According to The Dartmouth, the 43 students allegedly skipped class, but got other students to sign in for them and answer questions using an electronic clicker. “Each clicker is registered with one student, who gains points for submitting answers to certain in-class questions,” The Dartmouth reports. The course — “Sports, Ethics and Religion” — is taught by Dartmouth religion professor Randall Balmer and is the largest course at the college this term, with 272 students. “Attendance and participation account for about 15% of a student’s grade in the class,” The Dartmouth reports. Balmer told The Dartmouth that the course is specifically designed for student athletes. According to the newspaper, about 68% of the students enrolled in “Sports, Ethics and Religion” are Dartmouth varsity athletes. “I wanted to appeal to their interest, have a positive experience, allow them to succeed and build on that for their remainder of Dartmouth … Obviously it’s a great disappointment to me that many of the students, including many athletes, subverted the whole experience,” Balmer told The Dartmouth. Several weeks ago, Balmer said, he began to suspect that students were skipping class and sending their clickers to class with friends to gain points for attendance. On Oct. 30, Balmer measured how many students were in class. After asking the class a question to answer on their clickers, he passed out a paper version of the same question — “In the world of sports, what happened on August 22, 1926” — to each student in the classroom. It is unclear what, if any, disciplinary measures will be taken against the 43 accused students.